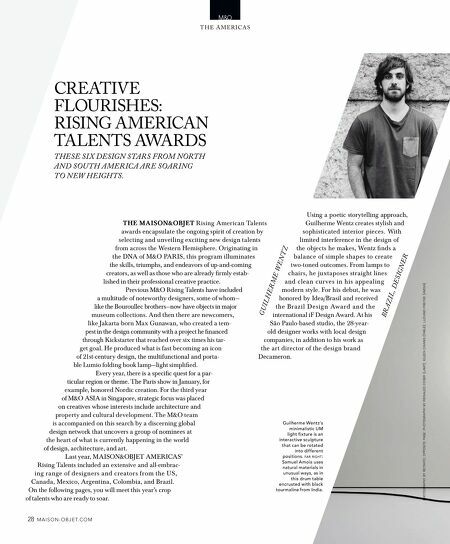 photography by retrato; opposite page: photography by reinaldo coser (l amp); eileen chiang (table); luciano freitas (amoia) 28 m a i s o n - o b j e t. c o m T h e A m er i cA s m&O m&O creATiVe FLOUrishes: rising AmericAn TALenTs AwArds These six design sTars from norTh and souTh amer ica are soar ing To new heighTs. Th e M a ison&obj eT R ising A mer ica n Ta lent s awards encapsulate the ongoing spirit of creation by select ing a nd unveiling excit ing new desig n t a lent s from across the Western Hemisphere. Originating in the DNA of M&O PAR is, this program illuminates the skills, triumphs, and endeavors of up-and-coming creators, as well as those who are already firmly estab- lished in their professional creative practice. Previous M&O Rising Talents have included a multitude of noteworthy designers, some of whom— like the Bouroullec brothers—now have objects in major museum collections. And then there are newcomers, like Jakarta-born Max Gunawan, who created a tem- pest in the design community with a project he financed through Kickstarter that reached over six times his tar- get goal. He produced what is fast becoming an icon of 21st-century design, the multifunctional and porta- ble Lumio folding book lamp—light simplified. Every year, there is a specific quest for a par- ticular region or theme. The Paris show in January, for example, honored Nordic creation. For the third year of M&O AsiA in singapore, strategic focus was placed on creatives whose interests include architecture and property and cultural development. The M&O team is accompanied on this search by a discerning global design network that uncovers a group of nominees at the heart of what is currently happening in the world of design, architecture, and art. Last year, MAisON&OBJET AMERicAs' Rising Talents included an extensive and all-embrac- i ng r a nge of de s ig ner s a nd c rea t or s f rom t he Us , canada, Mexico, A rgentina, colombia, and Brazil. On the following pages, you will meet this year's crop of talents who are ready to soar. guilher me wenTz br azil, designer Using a poetic storytelling approach, Guilherme Wentz creates stylish and sophist icated inter ior pieces. Wit h limited interference in the design of t he objects he makes, Went z finds a ba la nce of si mple shapes to create two-toned outcomes. From lamps to cha irs, he juxt aposes st ra ight lines a nd clea n cu r ves i n h i s appea l i ng modern st yle. For his debut, he was honored by idea/ Brasil and received t he B r a z i l D e s i g n Aw a r d a nd t he international iF Design Award. At his são Paulo-based studio, the 28 -year- old designer works with local design companies, in addition to his work as t he a r t director of t he desig n bra nd Decameron. Guilherme Wentz's minimalistic UM light fixture is an interactive sculpture that can be rotated into different positions. 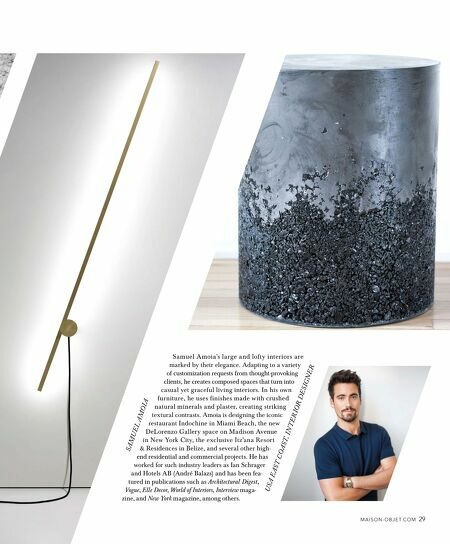 far right: Samuel Amoia uses natural materials in unusual ways, as in this drum table encrusted with black tourmaline from India.